Happy little daughter with down syndrome stirring fresh salad while preparing healthy food together with cheerful mother in the kitchen. Caring mother teaching her special needs child cooking. Concentrated little girl with down syndrome decorating gingerbread with icing in the kitchen. 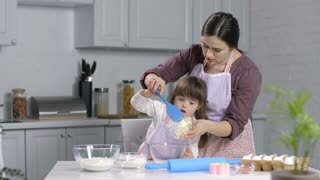 Caring mother teaching child with special needs baking and decorating homemade cookies with royal icing. Loving caring mother whirling giggling little daughter with down syndrome in domestic kitchen while enjoying cooking together. Joyful mom spinning her happy special needs child around in the kitchen. Caring loving mother developing motor skills and adaptive behavior of her preschool daughter with down syndrome through teaching cooking. Mom and special needs child using cookie cutters while baking. 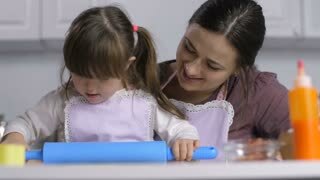 Portrait of concentrated little girl with down syndrome rolling out dough with rolling pin on the kitchen table while mother teaching child to cook. Family with special needs child cooking together. 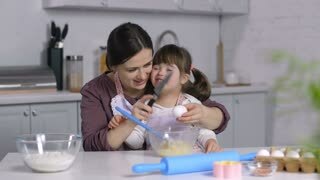 Caring mother teaching her cute little daughter with special needs breaking eggs into bowl while preparing homemade dough in the kitchen. Lovely girl with down syndrome helping her mother with dough. Engrossed girl with special needs and loving mother preparing homemade dough for baking in the kitchen. Caring mom teaching child with down syndrome cooking, developing motor skills and capabilities. 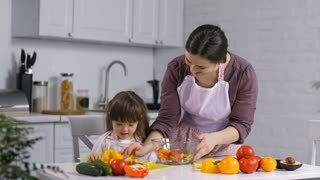 Loving mother and smiling little daughter with special needs wearing matching apron mixing vegetable salad in the kitchen. Cheerful girl with down syndrome learning cooking with mother's assistance. Cute little daughter with down syndrome helping her loving mother to prepare healthy fresh salad in domestic kitchen. Positive child with special needs and mother cooking healthy food in the kitchen. 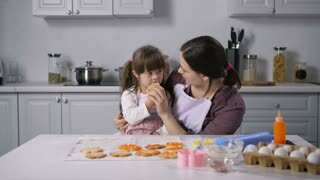 Lovely little girl with down syndrome eating cookies in the kitchen while caring mother teaching her child body and sign language. Mom helping daughter with special needs with cognitive development. Caring attentive mother teaching her cute little girl with down syndrome cooking in domestic kitchen. Loving mom helping daughter with special needs to cut cucumber on chopping board indoors. Joyful cute handicapped down syndrome child with smiling mother preparing food together in domestic kitchen. Positive cute little girl with special needs learning cooking with caring mom at home.